Lynne Kelly set out to write something quite different for her PhD dissertation: about animal behaviour and indigenous stories. At Stonehenge, she had an epiphany that led to an in-depth examination of non-literate societies. Archaeologists and others have been making assumptions about structures in the landscape, and objects found there, for as long as they have been puzzling about them. These assumptions have been based on the social and political context in which these investigators and thinkers were living at the time, and those contexts are always changing. It is hard for it to be otherwise. In the societies in which the archaeologists lived, large structures had religious, political or ceremonial purposes; holes in the ground were, in their societies, usually for burial or storage. Those purposes were then ascribed to what they found had been left by ancient peoples. Lynne Kelly is herself a product of her society. Fortunately, this has, for her, included important personal contact with Australian Aboriginal elders. Through these contacts and through her extensive reading, Lynne realised that much had been misinterpreted about the past. As her travel and research continued, she was able to find a commonality in the use by non-literate societies of memory paths or songlines. The initiated elders in all of these societies, as demonstrated by elders in extant non-literate societies, were able to remember vast tracts of knowledge in song, verse and dance, by attaching elements of that knowledge to features and objects in the landscape – natural and human-made and human-installed. The often-maligned ‘walkabout’ of Australian Aborigines was their walking of the songlines to keep the knowledge alive. This knowledge was critical to the survival of the people. It encompassed their genealogy, plant and animal knowledge, information about when, where and how to gather or hunt, historical events, seasonal changes, law, allegiances, personal relationships, property and everything else they needed to know about. On the northern coast of Queensland, Aborigines still sing and dance about the rising of the sea that happened some 10,000 years ago and that flooded the continental shelf that is now the base for the Great Barrier Reef. These stories were dismissed as fanciful ‘mythology’ by non-aboriginal Australians until geologists, recently, discovered the accuracy of these stories. Similarly, the stories told to the first European settlers who came in the 1830s to what is now Melbourne; they told that what is now Port Phillip was, until around 10,000 years ago a large plane with a river running through it to a waterfall emptying into the sea. This, again, has been confirmed by geologists. In this book, Lynne Kelly explains how, with the transition for hunter-gatherers to settled farmers, each of these pre-literate societies turned their songlines (which required long journeys along the features that were associated with their knowledge) into large, local structures, such as the henges, mounds and stone avenues of Britain, Ireland and France, the pyramids in Central and South America and extensive complexes in what is now the USA. Lynne’s theory is that these structures allowed the initiated elders to ‘journey’ along elements of the structures, remembering their songs and dances. She also postulates that many of these structures included performance spaces, to keep the knowledge alive in the society. She extends this theory to the statues on Easter Island. Not content with theory alone, Lynne Kelly has ‘created’ songlines of her own, in and around the Victorian country town where she now lives, in which she has invested an impressive body of knowledge, including genealogy, history and natural history. She has also experimented with personal memory objects that can function as a portable memory aid of a song line. In the process, she has discovered that this way of laying down and recovering knowledge works in a very different way from our modern way of remembering facts: it is more holistic and encourages new connections to be made between seemingly disparate things. 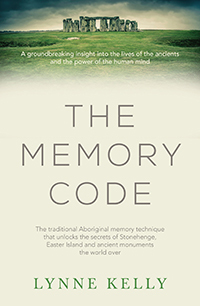 The Memory Code is a brave exposition of a new way of looking at the misunderstood knowledge and rituals of pre-literate societies, both extant and those that have long vanished. Lynne Kelly is generous in her acknowledgement of other people, giving credit for ideas they have put forward in writing and in personal discussions she has had with many of them. She has visited and writes about cultures on every continent that has borne people. The book has many informative photos and illustrations and is well indexed. “Our song cycles have the greatest importance in the lives of my people. They guide and inform our lives. A song cycle tells a person’s life: it relates to the past, to the present and to the future. Yolngu balance our lives through the song cycles that are laid out on the ceremony grounds. These are the universities of our people, where we hone and perfect our knowledge. I am sure that Lynne Kelly would understand him.